Fats and oils are made up of individual molecules called fatty acids. They're chains made of carbon and hydrogen atoms that have a carboxyl group at one end and a methyl group at the other. Carboxyl groups contain one carbon atom, one hydrogen atoms, and two oxygen atoms, and methyl groups include one carbon atom and three hydrogen atoms. The carbon atoms in the fatty acid molecules are linked by single or double bonds. Fatty acids vary in length. Short-chain fatty acids have two to four carbon atoms; medium chain fatty acids have six to 12 carbons atoms, long fatty acids have at least 14 carbon atoms in the chain. Fatty acids are either saturated or unsaturated. Saturated fatty acids have no double bonds between any of the carbon atoms in the chain. Unsaturated fatty acids have one or more double bonds in the carbon chain. Monounsaturated fatty acids have one double bond, and polyunsaturated fatty acids have at least two double bonds. Unsaturated fatty acids are sometimes named by the position of the double bonds in the carbon chain. The names omega-3,-6 or -9 refer to the locations of the first double bond in the three different fatty acid molecules. Unsaturated fatty acids can have two different configurations of the hydrogen atoms on either side of the double bonds. These are referred to as "cis" or "trans" configurations. Cis configurations have those hydrogen atoms both on the same side of the molecule. The cis configuration makes the molecule look like it's bent. Trans configurations have those hydrogen atoms on opposite sides of the double bond. This arrangement gives the molecule a linear appearance, like saturated fats. Interestingly, it turns out that both saturated fats and trans fats are bad for your health. Cholesterol is a waxy substance doesn't produce any energy like triglycerides, but it is essential for many biochemical processes and hormone production. However, you can have too much of a good thing. Elevated cholesterol levels have been associated with an increased risk of cardiovascular disease. The cholesterol in your body is mostly made in your liver. There are three different types: High-Density Lipoproteins (HDL), Low-Density Lipoproteins (LDL) and Very Low-Density Lipoproteins (VLDL). Having higher HDL cholesterol levels can decrease your risk of cardiovascular disease while elevated LDL cholesterol will increase that risk. Dietary fats are called triglycerides. A triglyceride is made up of three fatty acid molecules attached to a glycerol molecule. Your body can use triglycerides as energy or store them as adipose tissue (body fat). The fatty acids determine the overall shape. Fats that are composed of triglycerides with saturated fatty acids, like meat, are solid at room temperature. Fats consisting of triglycerides with unsaturated and monounsaturated fatty acids, like vegetable oils and olive oil, are liquid at room temperature. Tropical oils like coconut, palm, and palm kernel oil can be fractionated or heated, and then cooled. Fractionation separates the oil into different fractions based on temperature. The fractions with the higher melting points are thicker at room temperature and are sometimes used as an ingredient in chocolate coatings to keep them from melting at room temperature. Saturated fats are mostly from animal sources, although saturated fats are also found in coconut oil, palm oil, and palm kernel oil. Saturated fats can affect cholesterol levels in the body. In fact, saturated fats will raise your cholesterol much more than eating dietary cholesterol does. Eating a diet rich in red meat has been linked to an increased risk of cardiovascular disease and some cancers. Since red meat has the highest concentration of saturated fats, many experts suggest that you limit your consumption of red meat to only two or three small servings per week. Monounsaturated fats are liquid at room temperature, but solid when refrigerated. Olive oil contains a well-known monounsaturated fatty acid call oleic acid. Canola oil, peanuts, and avocados also contain some monounsaturated fats. Consumption of monounsaturated fatty acids has been shown to help keep LDL cholesterol levels low and HDL cholesterol high. Polyunsaturated fats come mostly from plant sources like nuts, seeds, and vegetable oils and include omega-3 and omega-6 fats. These fats are liquid at room temperature and often stay liquid when refrigerated. Fish is also a good source of polyunsaturated omega-3 fats, especially cold water, oily ocean fish. So unless you're a vegan or vegetarian, you should eat at least three servings of fish each week. Most red meat is low in polyunsaturated fats, but animals raised on grass instead of corn-based feeds have meat that has more polyunsaturated fats and lower in fat in general. The essential fatty acids are so named because you need to get them from your diet. Your body can make many of the fats it needs from other types of fatty acids, but the omega-6 and omega-3 polyunsaturated fatty acids must come from the diet. Omega-6 fatty acids come from vegetable oils, nuts, and seed oils. Most people get plenty of these fats from their diets (usually more than enough). Omega-3 fatty acids are often deficient. Many experts believe that eating a diet with too many omega-6 fats and too few omega-3 fats increase your risk of inflammation and chronic disease. Getting enough omega-3 fatty acids from your diet or as dietary supplements will help to reduce inflammation, regulate heart rhythm and keep your cholesterol levels normal. When you don't get enough of the essential fatty acids in your diet, you may have dry skin, dry hair and increased inflammation. 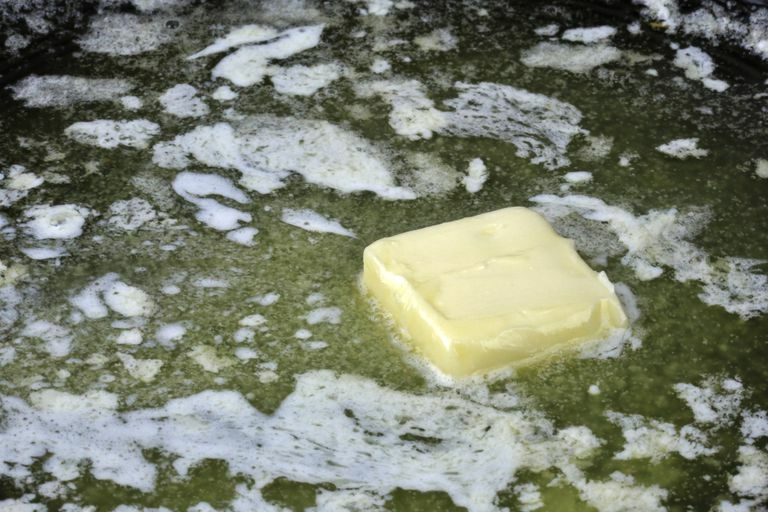 Most trans-fats are created artificially by a process called hydrogenation. It involves heating regular vegetable oil and forcing hydrogen atoms onto the polyunsaturated fatty acid molecules. This process turns the oil into a solid substance and improves the shelf life of the fat. Fully hydrogenating a vegetable oil will make it firm and not create trans-fats. However, the firmness of the fat makes it difficult to use in cooking. Partially hydrogenating an oil makes for a softer product and is still widely used in baking and processing foods. Examples include stick margarine and partially hydrogenated frying oils. Trans-fats are commonly found in donuts, snack cakes, cookies, and processed foods. When it comes to your heart health, artificially created trans fats are worse than saturated fat. Eating too many trans-fats has been linked to increasing your risk of cardiovascular disease. Not all trans fats are created in the lab. Small amounts of natural trans fats occur in milk and beef. Conjugated linoleic acid is a well-known natural trans-fat. The natural trans-fats do not appear to be as unhealthy as the artificial trans-fats. Digestion of fat begins in the mouth where the food you chew is mixed with a small amount of lingual lipase that is found in your saliva. Lingual lipase is a digestive enzyme that breaks fatty acids apart from triglycerides. Once you swallow your food, digestion continues in the stomach. The food you eat is squished and mixed with stomach enzymes. The lipase works in the stomach, but most fat digestion takes place in the small intestine. Your liver produces bile, which is stored in the gallbladder until it's triggered by eating foods that contain fat. Bile is released into the small intestine where it works like a detergent to emulsify the fats into smaller droplets. This makes it easier for pancreatic lipase to get to the triglycerides. The bile and lipase break fats down into smaller pieces that are absorbed into the bloodstream. The bile, which contains cholesterol, is either reabsorbed into the blood or bound to soluble fiber in the intestine and eliminated in the stool. Eating foods with lots of soluble fiber helps keep your cholesterol levels healthy by grabbing more of the cholesterol from the bile and removing it from your body. Smolin LA, Grosvenor, MB. Nutrition: Science and Applications. Third Edition. Wiley Publishing Company, 2013.